This manuscript follows the adventurous and romantic exploits of the medieval nobleman Gillion de Trazegnies, who journeys to Egypt on pilgrimage, mistakenly becomes a bigamist, and dies in battle as a glorious hero. Alongside detailed depictions of European architecture and contemporary dress, there are also imaginative references to exotic Eastern travel and customs, such as camels, flashing scimitars, and figures in turbans. The tale includes faithful love, nefarious villains, family loyalty, and violent combat. The artist, Lieven van Lathem, takes full advantage of the tale's dramatic possibilities in the book's eight miniatures and 44 historiated initials. Lively figures, light-filled landscapes, and complex visual narratives are distinctive traits of his style that reflect the greatest developments of Renaissance panel painting and anticipate others. Rather than having other artists complete the decorations in the margins, as his contemporaries might have, this manuscript also features the elegance and delight of his figures in the borders, too. This is one of only four known manuscripts in French of this romance. Designed to be read aloud, a reader would likely have shown images to the audience and broken off each evening at a cliffhanger moment to be continued the next evening. The book was commissioned by Louis de Gruuthuse (1422-1492), trusted advisor of Philip the Good, Duke of Burgundy and one of the great book collectors of the Middle Ages. He amassed a library of almost two hundred volumes at a time when the English royal collection was composed of less than half that number. Inglis, Erik. "Expertise, Artifacts, and Time in the 1534 Inventory of the St-Denis Treasury." The Art Bulletin XCVIII, no. 1, p. 28. Dibdin, T. F. The Biographical Decameron, or Ten Days Pleasant Discourse upon Illuminated Manuscripts and Subjects Connected with Early Engraving, Typography, and Bibliography (London: Shakespeare Press, 1817), pp. cciii-cciv. Lacaita, J. P. Catalogue of the Library at Chatsworth (London: Chiswick Press, 1879), pp. 4, 322. "La bibliothèque de Chatsworth." Bibliothèque de l'École des Chartes 40 (1879), p. 651. Bayot, A. Le Roman de Gillion de Trazignies (LouvainUniversité de Louvain, 1903), p. 24. Exhibition of Illuminated Manuscripts, exh. cat. (London: The Burlington Fine Arts Club, 1908), pp. 79-80, no. 160, pl., ill.
Durrieu, Paul. "Découverte de deux importants manuscrits de la 'Librairie' des Ducs de Bourgogne." Bibliothèque de l'école des chartes 71 (1910), pp. 58-71. Lindner, Arthur. Der Breslauer Froissart: Festschrift des Vereins für Geschichte der bildenden Künste zu Breslau, zum fünfzigjährigen Jubiläum verfasst in Auftrage des Vereins (BerlinKommissions-Verlag von Meisenbach, Riffarth & Co, 1912), pp. 53-54. Winkler, Friedrich. "Studien zur Geschichte der niederländischen Miniaturmalerei des XV. und XVI. Jahrhunderts." Jahrbuch der Kunsthistorischen Sammlungen des allerhöchsten Kaiserhauses 32, no. 3 (1915), pp.302-03. Winkler, Friedrich. Die flämische Buchmalerei des XV. und XVI. Jahrhunderts (Leipzig: Verlag von E. A. Seemann, 1925), pp. 90, 169. Smital, Ottokar. Das schwarze Gebetbuch des Herzogs Galeazzo Maria Sforza (Vienna: Handschrift 1856, 1930), p. 46. Ham, Edward Billings. "Le Manuscrit de Gillion de Trazignies à Chatsworth." In Romania 58 (1932), pp.66-77. Woledge, B. Bibliographie des romans et nouvelles en prose française antérieurs à 1500 (GenevaDrozLille, Giard, 1954), pp. 48-49, no. 68. Delaissé, L.M.J. De gouden eeuw der Vlaamse miniatuur: het mecenaat van Filips de Goede, 1445-1475, exh. cat. (Brussels: Bibliothèque royale de Belgique, 1959), pp. 136-137, no. 160. La Miniature flamande: Le Mécénat de Philippe le Bon, exh. cat. (Brussels: Palais des Beaux-Arts, 1959), pp. 131-132, no. 160. Duverger, Jozef. "Hofschilder Lieven van Lathem (ca. 1430-1493)." Jaarboek van het Koninklijk Museum voor Schone Kunsten Antwerpen. A. Monballieu, ed. (Antwerp: Uitgegeven door het Koninklijk Museum voor Schone Kunsten te Antwerpen, 1969), p. 101. Doutrepont, Georges. La littérature française à la cour des Ducs de Bourgogne: Phillipe le Hardi - Jean sans Peur - Philippe le Bon - Charles le Téméraire (Paris: Libr. speciale pour l'histoire de France, 1909; repr., Geneva: Slatkine Reprints, 1970), pp. 43-49. Medieval and Early Renaissance Treasures in the North West, exh. cat. (Manchester: Whitworth Art Gallery, 1976), p. 30, no. 51, pl. 12. Blunt, Anthony. Treasures from Chatsworth: The Devonshire Inheritance; A Loan Exhibition from the Devonshire Collection, by permission of the Duke of Devonshire and the Trustees of the Chatsworth Settlement, exh. cat. (Richmond: Virginia Museum of Fine Arts, 1979), p. 64, no. 130. Lemaire, Claudine and Antoine de Schryver, Vlaamse Kunst op Pergament (Bruges: Gruuthusemuseum, 1981), pp. 213, 229, no. 135. Horgan, F. "A critical edition of the romance of Gillion de Trazegnies from Brussels, Bibliotheque royale Ms. 9629k." Ph.D. diss. (University of Cambridge, 1985), p. lxxxi. Dogaer, Georges. Flemish Miniature Painting in the 15th and 16th centuries (Amsterdam: B.M. Israël B.V., 1987), p. 136. Schryver, Antoine de. Le Pontifical de Ferry de Clugny, Cardinal et Évêque de Tournais (Vatican CityBiblioteca Apostolica Vaticana, 1989), p. 74. Devonshire, Deborah Vivien Freeman-Mitford Cavendish. Treasures of Chatsworth, A Private View (London: Constable, 1991), p. 188. Martens, Maximiliaan, ed. Lodewijk van Gruuthuse: Mecenas en europees Diplomaat, ca. 1427-1492, exh. cat. (Bruges: Gruuthuse-museum, 1992), pp. 164-69, no. 4, pls. on 114, 118, 120, 165, 166, 168, 170, 197. Lacarrière, Jacques, ed. Alexandre le Grand, La vie légendaire (ParisÉditions Du Félin, 1993), p. 211. Van Eyck to Breugel, 1400 to 1550: Dutch and Flemish Painting in the Collection of the Museum Boymans-van Beuningen (Seattle: University of Washington Press, 1994), p. 165, n. 4. Straub, Richard. David Aubert, escripvain et clerc (Amsterdam: Rodopi, 1995), pp. 113-16, 247, 251-67. Wolf, Eva. Das Bild in der spätmittelalterlichen Buchmalerei: Das Sachsenheim-Gebetbuch im Werk Lievin van Lathems (Hildesheim: Georg Olms Verlag, 1996), pp. 154-155, 252-254, 255n4. Brinkmann, Bodo. The Dictionary of Art 19 (New York: Grove, 1996), p. 350. Lafitte, M. P. "Les manuscrits de Louis de Bruges." In Le Banquet du Faisan, L 'Occident face au défi de 1 'Empire ottoman, ed. M.-T. Caron and D. Clauzel (Arras: Artois Presses Université, 1997), p. 246. Randall, Lilian M. C., et al. Medieval and Renaissance Manuscripts in the Walters Art Gallery. Vol. 3, Belgium, 1250-1530 (Baltimore: The Johns Hopkins University Press in association with the Walters Art Gallery, 1997), pt. 2, p. 369, under no. 273. Smeyers, Maurits. L'Art de la miniature flamande du VIIIe au XVIe siècle (TournaiLa Renaissance Du Livre, 1998), pp. 405-06, fig. 69. Prevenier, Walter, and Wim Blockrnans. Prinsen en Poorters: beelden van de laat-middeleeuwse samenleving in de Bourgondische Nederlanden, 1384-1530 (Leiden: Mercatorfonds, 1998), p. 42, ill.
Raynaud, Chistiane. "A la Hache!" Histoire et symbolique de la hache dans la France médiévale, XIIIe-XVe siècles (ParisLéopard d'Or Edition, 2002), pp. 429, 653. Paviot, Jacques. Les ducs de Bourgogne, la croisade et l'Orient: fin XIVe sieÌcle-XVe sieÌcle (ParisPresses de l'Université de Paris-Sorbonne, 2003), pp. 213-214. Kren, Thomas, and Scot McKendrick, eds. Illuminating the Renaissance: The Triumph of Flemish Manuscript Painting in Europe, exh. cat. (Los Angeles: J. Paul Getty Museum, 2003), pp. 4, 223-24, 239-242; no. 58, entry by Scot McKendrick; pp. 245, 255, 315. Sebastian, F. Villaseñor. "Préstamos e influencias extranjeras en la miniature Hispanoflarnenca Castellana, 1450-1500." In El arte foráneo en España, Presencia e influencia, ed. M. C. Bravo (Madrid: Editorial CSIC, 2005), p. 229. Brown-Grant, Rosalind. French Romance of the Later Middle Ages: Gender, Morality and Desire (Oxford: Oxford University Press, 2008), p. 155.
de Schryver, Antoine, and Thomas Kren. 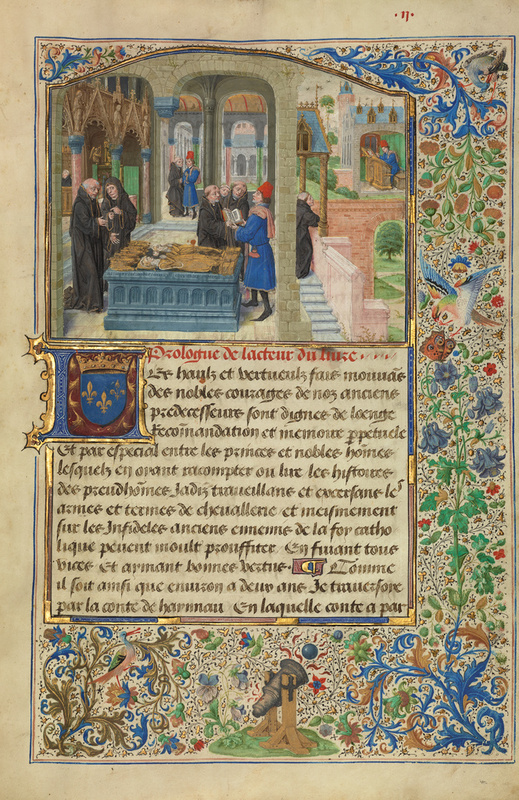 The Prayer Book of Charles the Bold: A Study of a Flemish Masterpiece from the Burgundian Court. Jessica Berenbeim, trans. (Los Angeles: J. Paul Getty Museum; Lucerne: Faksimile Verlag, 2007-2008), pp. 48, 134, 166, 176, fig. 71, 185. Verougstraete, H. et al., eds., The Quest for the Original (Leuven: Uitgeverij Peeters, 2009), p. 6. Campbell, Gordon. The Grove Encyclopedia of Northern Renaissance Art II (Oxford: Oxford University Press, 2009), p. 481. Hans-Collas, Ilona, and Pascal Schandel, eds. 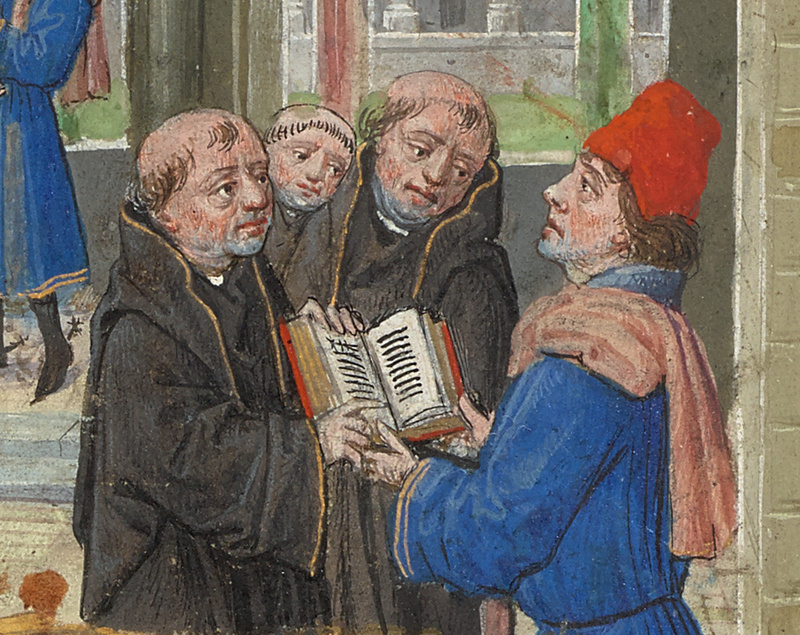 Manuscrits enluminés des anciens Pays-Bas méridionaux, 1: Manuscrits de Louis de Bruges (ParisBibliothèque nationale de France, 2009), pp. 78, 81, 84, 124, 298, 321. Marti, Susan, Till-Holger Borchert, and Gabrielle Keck, eds. Charles the Bold (1433-1477): Splendour of Burgundy, exh. cat. (Bern: Historisches Museum; Brussels: Mercatorfonds, 2009), p. 59, fig. 35. Vincent, Stéphanie. Le roman de Gillion de Trazegnies (TurnhoutBrepols, 2010), pp. 31, 38-41, 392-393. Delsaux, Olivier. "Les designations des manuscrits originaux en royen francais." In Original et originalité: Aspects historiques, philologiques et littéraires, eds. Olivier Delsaux and H. Haug (Louvain-La-NeuvePresses universitaires de Louvain, 2011), p. 58. Fisher, Celia. Flowers of the Renaissance (London: Frances Lincoln, 2011), pp. 88-89. Bousmanne, Bernard, Thierry Delcourt, eds. Miniatures flamandes 1404-1482, exh. cat. (Brussels: Bibliothèque royale de Belgique, 2011), p. 124n27, 287, 292, 406n7, pl. on pp. 120, 287, 289. Sotheby's, London. Three Renaissance Masterworks from Chatsworth. December 5, 2012, pp. 44-61, lot. 51, ill.
Klein, Marlene, trans. "Western Manuscripts & Miniatures: Londra, Sotheby's, 5 dicembre 2012." Alumina Pagine Miniate 11, no. 40 (Jan-Mar. 2013), p. 60. "Acquisitions Musée J. Paul Getty." Art de l'enluminure, no. 44 (Mar-May 2013), p. 68. Hindman, Sandra and Ariane Bergeron-Foote. Flowering of Medieval French Literature: "Au parler que m'aprist ma mere," exh. cat. (London: Paul Holberton Publishing, 2014), pp. 94, 98, ill.
Morrison, Elizabeth, and Zrinka Stahuljak. The Adventures of Gillion de Trazegnies: Chivalry and Romance in the Medieval East (Los Angeles: J. Paul Getty Museum, 2015). Belayew, Charlotte, and Bernard Bousmanne. La librairie des Ducs de Bourgogne: manuscrits conservés à la Bibliothèque Royale de Belgique (Turnhout: Brepols, 2015), vol. 5, p. 35.